I have never been, nor will I ever be, one of those parents who has it all together. I get the important stuff, but some of the fluff seems, well, just like fluff. I mean, I am always in awe of mothers and fathers who can hold a job, make homemade yogurt, and plan and execute a perfectly themed birthday party. I’m just not that creative and every theme that comes to mind seems overdone or overwhelming. But, you know what? Turns out, if you give me a theme and a task, I can have a lot of fun being one of those parents. A neighbor has a daughter who turned one the day my little one turned three. 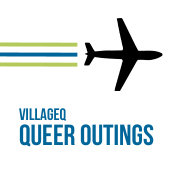 Our neighborhood is weird. When a kid has a birthday, the whole block is invited which means 40+ people (usually at least 20 kids in the bunch) of all ages. So our neighbor decided we should have a joint party with the theme You Are My Sunshine. Super cute, right? She managed to pull together sun themed songs to play, yellow decorations, and even sunshine games. Pin the smile on the sunshine anyone? I was only given two tasks: buy beer, make desserts. To be fair, she would have bought the desserts but I do like to bake and nothing tastes better than homemade cake. 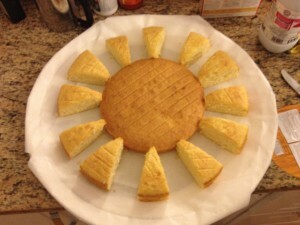 But how do you make a sunshine cake? 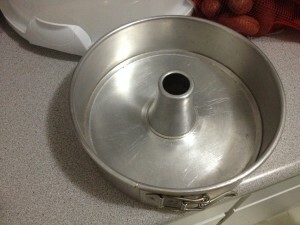 In the end, I made a 9-inch round cake and then another 9-inch cake with a funnel in the center. I cut the second cake into slices which were arranged on a platter as rays of sunshine. Then, I frosted the cake, added little orange chocolates for decoration and zam! 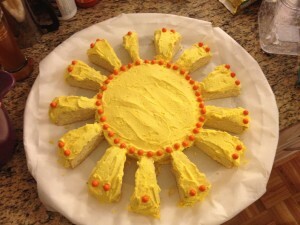 I made a sunshine cake! Preheat oven to 350 F. Grease the two pans. Blend the cake mix, milk, melted butter, eggs, and vanilla in a mixer. Scrape down sides and continue beating for a total of three minutes or more. The batter should look well blended. Divide the batter between the prepared pans, smoothing it out with a rubber spatula. Place pans in the oven next to each other. Bake until golden brown and springs back (27-29 minutes). Remove from oven and cool for 10 minutes. Run a dinner knife around the edge and invert them onto a rack. Allow to cool completely before frosting. Blend butter in electric mixer. Add everything else and mix.